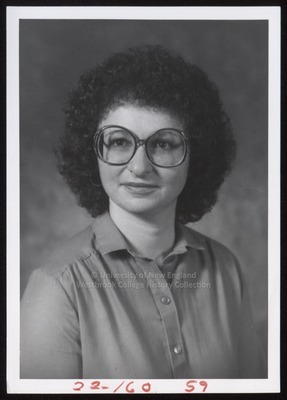 "Sheila Abrams, Westbrook College, 1979"
Westbrook College student Sheila Abrams poses for her senior class photo in this late 1970s black and white photograph with Press Herald, Wed, Oct 31, 1979, stamped on the back. Sheila wore a bright colored blouse and round, dark-framed glasses. Her hair was permed and curly.